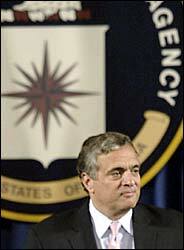 George Tenet was the director of the CIA from 1997 to 2004. George John Tenet was sworn in as Director of Central Intelligence on 11 July 1997 following a unanimous vote by both the Senate Select Committee on Intelligence and the full Senate. In this position he heads the Intelligence Community (all foreign intelligence agencies of the United States) and directs the Central Intelligence Agency. Mr. Tenet served as the Deputy Director of Central Intelligence, having been confirmed in that position in July 1995. Following the departure of John Deutch in December 1996, he served as Acting Director. Mr. Tenet previously served as Special Assistant to the President and Senior Director for Intelligence Programs at the National Security Council. While at the NSC, he coordinated Presidential Decision Directives on Intelligence Priorities, Security Policy Coordination, US Counterintelligence Effectiveness, and US Policy on Remote Sensing Space Capabilities. He also was responsible for coordinating all interagency activities concerning covert action. Prior to serving at the National Security Council, he served on President Clinton's national security transition team. In this capacity, he coordinated the evaluation of the US Intelligence Community. Mr. Tenet also served as Staff Director of the Senate Select Committee on Intelligence for over four years under the chairmanship of Senator David Boren. In this capacity he was responsible for coordinating all of the Committee's oversight and legislative activities including the strengthening of covert action reporting requirements, the creation of a statutory Inspector General at CIA, and the introduction of comprehensive legislation to reorganize US intelligence. Prior to his appointment as Staff Director, Mr. Tenet directed the Committee's oversight of all arms control negotiations between the Soviet Union and the United States, culminating in the preparation of a report to the US Senate on ``The Ability of US Intelligence to Monitor the Intermediate Nuclear Force Treaty. Mr. Tenet came to the Committee in August of 1985, as designee to the Vice Chairman, Senator Patrick Leahy, after working three years on the staff of Senator John Heinz as both a legislative assistant covering national security and energy issues and as legislative director. Mr. Tenet holds a B.S.F.S. from the Georgetown University School of Foreign Service and an M.I.A. from the School of International Affairs at Columbia University. Author Ron Suskind has accused Tenet of procuring a forged letter, on the orders of the White House, that linked Saddam Hussein to Al Qaeda. The second nugget involves a supposed order from the White House to me at the CIA to have my staff fabricate a letter connecting Iraq with Al Qa’ida and the attacks of 9/11. Suskind says that CIA was directed to get an Iraqi official to copy the bogus information in his own hand — and then cause it to be leaked to the media. There was no such order from the White House to me nor, to the best of my knowledge, was anyone from CIA ever involved in any such effort. It is well established that, at my direction, CIA resisted efforts on the part of some in the Administration to paint a picture of Iraqi-Al Qa’ida connections that went beyond the evidence. The notion that I would suddenly reverse our stance and have created and planted false evidence that was contrary to our own beliefs is ridiculous. Ron: The intent--the basic raison d'etre of this product is to get, is to create, here's a letter with what's in it. Okay, here's what we want on the letter, we want it to be released as essentially a representation of something Habbush says. That's all it says, that's the one paragraph. And then you pass it to whomever to do it. To get it done. Ron: Right. You saw the original with the White House stationery, but you didn't--down the ranks, then it creates other paper. Rob: Yeah, no, exactly. But I couldn't tell you--again: I remember it happening, I remember a terrible brief kinda joking dialogue about it, but that was it. The New York Times says that Bush's announcement of Tenet's resignation was made "in a way that was almost bizarre." Bush "had just addressed reporters and photographers in a fairly innocuous Rose Garden session with Prime Minister John Howard of Australia. Then the session was adjourned, as Mr. Bush apparently prepared to depart for nearby Andrews Air Force Base and his flight to Europe, where he is to take part in ceremonies marking the 60th anniversary of the Normandy invasion and meet European leaders — some of whom have been sharply critical of the campaign in Iraq. Tenet's move came amid new storms over intelligence issues, including an alleged Pentagon leak of highly classified intelligence to Ahmad Chalabi, an Iraqi politician. At the same time, a federal grand jury is pressing its investigation of the leak of a CIA operative's name, and Bush acknowledged he might be questioned." The CIA denied that Tenet's resignation was connected with any of the those issues. "Absolutely not," said Mark Mansfield, CIA spokesman. Tenet had been under fire for months in connection with intelligence failures related to the U.S.-led war against Iraq, specifically assertions the United States made about Saddam Hussein's purported possession of weapons of mass destruction, and with respect to the threat from the al-Qaida terrorist network. In April a panel investigating the Sept. 11 attacks released statements harshly criticizing the CIA for failing to fully appreciate the threat posed by al-Qaida before the terrorist hijackings. Tenet told the panel the intelligence-gathering flaws exposed by the attacks will take five years to correct. William Branigan adds in the June 3, 2004, The Washington Post that "The timing of Tenet's resignation came as a surprise in Washington, and its rationale was greeted with a measure of skepticism." "At the Center of the Storm: My Years at the CIA", HarperCollins, April 30, 2007 (Hardcover), ISBN-10: 0061147788 / ISBN-13: 978-0061147784; HarperLuxe; Largeprint edition, April 30, 2007, ISBN-10: 0061234419 / ISBN-13: 978-0061234415. ↑ George J. Tenet, CIA, via the Internet Archive, accessed 9 November 2008. ↑ Book says White House ordered forgery, by Mike Allen, politico.com, 5 August 2008. ↑ Tenet statement on Suskind, poilitico.com, 5 August 2008. ↑ The Way of the World transcripts, accessed 8 August 2008. ↑ CIA director Tenet resigns, by William Branigin, Washington Post, 3 June 2004. ↑ Tenet resigns as head of CIA, by Pete Yost, the Associated Press, 3 June 2004. This page was last modified on 11 June 2013, at 16:34.